The ability to carry water is critical to any bug-out plan. Food you can live without for a while, but water should be consumed every day to maintain your bodies abilities at peak levels. Water bottles are one of the most common methods for carrying water. Bottles are generally easier to fill and often more durable than bags or other methods. 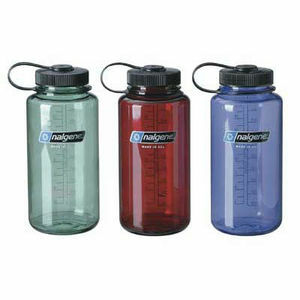 While the nalgene bottles pictured below are very durable for the same price you can buy a steel water bottle. The advantage of steel being the ability to boil water in it. This page was last modified on 21 January 2014, at 18:04.